Monte Generoso has always been one of the most important attractions in Ticino. It offers one of Switzerland's oldest cog rail trains combined with beautiful views and many hiking opportunities. Can you imagine how excited we were when the new Fiore di Pietra ("Stone Flower") complex opened on top of Monte Generoso? 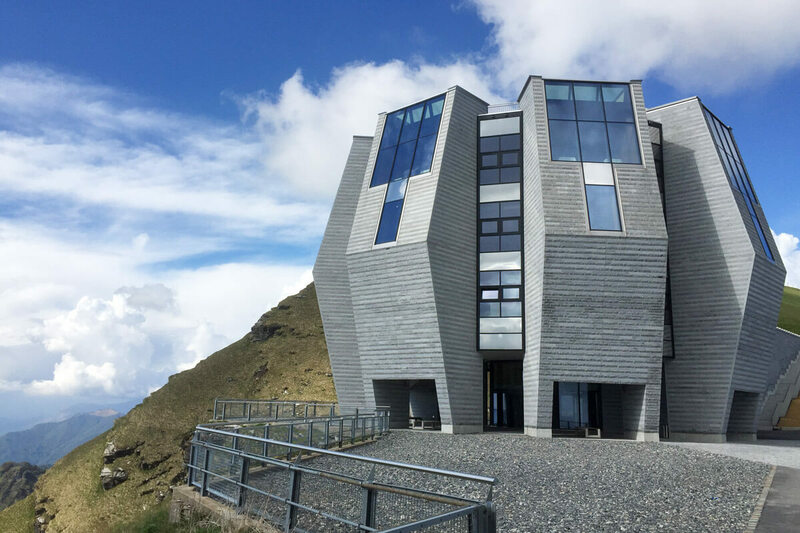 A building in the shape of a blooming flower, built in stone and glass, gleaming from the very top of the mountain at 1700 meters above sea. It is so big and beautiful that you can actually see it when walking on the promenade in Lugano! The Fiore di Pietra is easily reachable with the cog rail, directly from Capolago-Riva S. Vitale station. The rides are always a great hit for families, as you are taken through the best and most scenic route while climbing up the mountain. If you want a unique experience, you can even catch the special vintage ride on the original steam locomotive from 1890, the oldest in Switzerland! These special rides are taking place every other Sunday, all through summer. In case you are not into trains, an alternative is to hike up to the top and take the train back. We chose the "small" hike from Belvedere and walked up to the top. Reaching Belvedere by car is an adventure, so I *strongly* suggest you avoid our mistake and leave your car at home, relying on public transport only. The hike to Monte Generoso is pleasant as your path will be passing through woods, always rewarding you with a spectacular view. Along the way, you will meet the cog rail a few times. 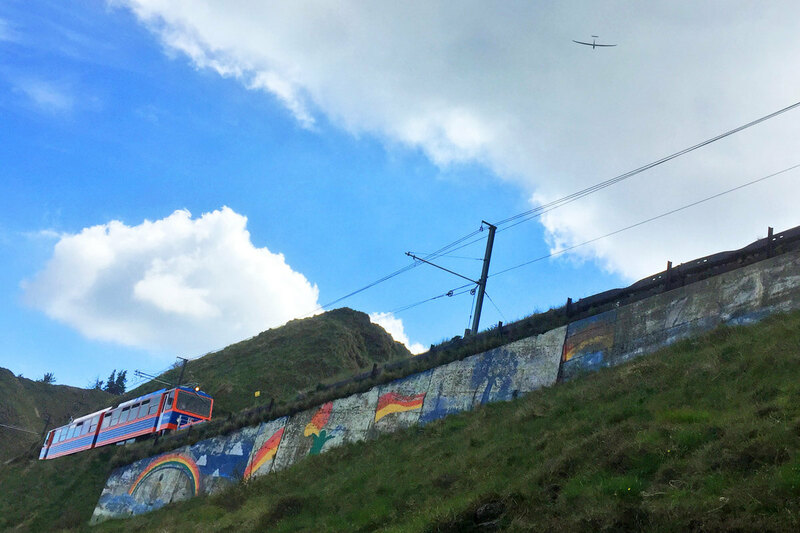 We had a very poetic encounter with a train, graffiti and a glider plane all in one picture! When you reach the top, take a moment to soak in the panoramic vistas. First of all, the Fiore di Pietra itself is marvelous. Designed by the world famous local architect, Mario Botta, it is majestic, shiny and perfectly placed on the edge of the cliff and against the blue sky. What a truly breathtaking sight! Then, take in the rest of the scenery, feeling like you are on top of the world. 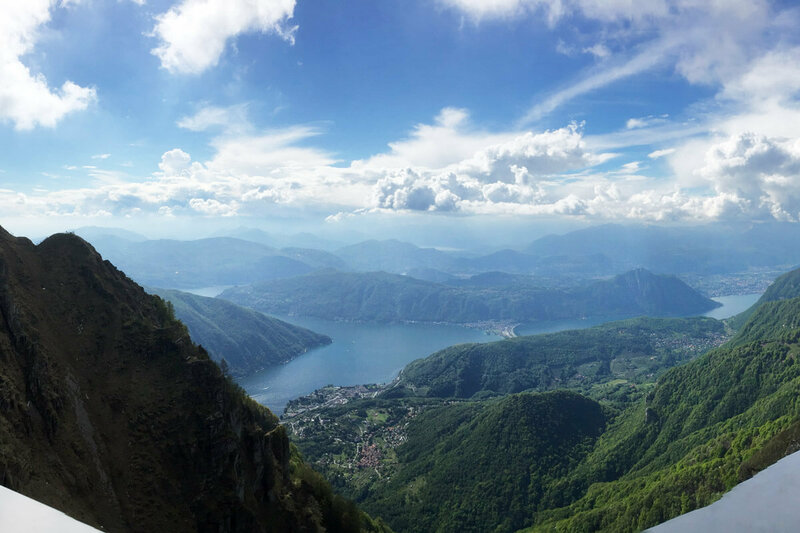 Monte Generoso can easily be described as the best mountain panorama in all of Ticino. Not only can you see as far as the Gotthard and the Jungfrau... On bright, windy days, you can see Monte Rosa, Gran Paradiso, Cervino and all of the Italian Alps. And even further south, you can almost see Milano itself! If all this viewing has made you hungry or thirsty, there are two restaurants in the Fiore di Pietra. Thanks to the conference and event facilities for every occasion, wedding parties are very popular up there. So, if you have not planned your trip to Monte Generoso already, I suggest you put it on your Ticino bucket list. We are thrilled and already looking forward to our next visit! 3. Do you feel adventurous? Take the "Via Ferrata", a climbing route not for the faint of heart. Starting from the top, this route includes ladders, steel ropes and lots of breath-taking scenery. 4. There are take-off and landing spots for paragliding, as well as plenty of mountain bike routes starting from Belvedere at 1223 meters above sea. 5. If you are in for a more relaxing experience, there is also an astronomic observatory where you can study stars and planets.